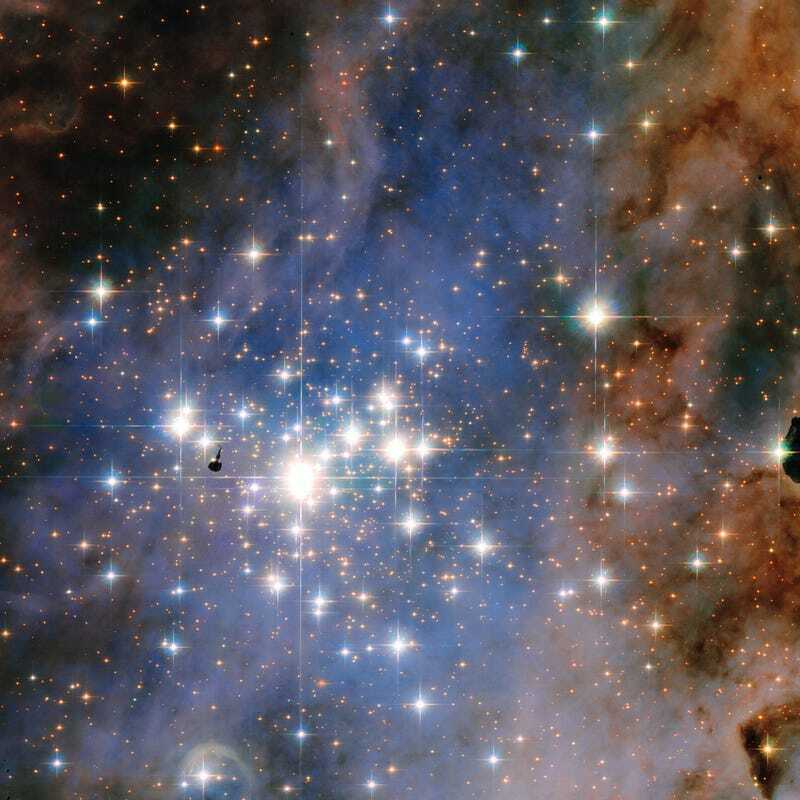 Behold Trumpler 14, a dazzling star cluster located 8,000 light-years from Earth. Situated within the Carina Nebula, it’s home to one of the highest concentrations of massive, bright stars in the Milky Way. But as spectacular as these stellar objects appear be, their majestic appearance comes at a price. This family of white-blue stars are embodiments of the “live fast, die young” approach to existence. They’re just 500,000 years old, so they’re relative newcomers to the galaxy—but they’re quickly burning up their vast supplies of hydrogen. Packed close together, these luminous stars look absolutely awesome, but they only have a few million years left before they explode as supernovae. Trumpler 14—one of the largest collections of hot, massive stars in the Milky Way. There are about 2,000 stars in Trumpler 14, some of them several tens of times larger than our Sun. The big bright star is supergiant HD 93129Aa, one of the hottest and most brilliant stars in the Milky Way. As they burn, these stars are hurtling high-speed particles out into space. When these winds hit surrounding material, they produce a shock wave that heats the gas to millions of degrees and trigger intense bursts of X-rays. These stellar winds affect the shape of nearby clouds of gas and dust, while also kindling the birth of new stars. And in fact, that arc-shaped cloud at the bottom of the image is a bow shock that was produced by these winds. 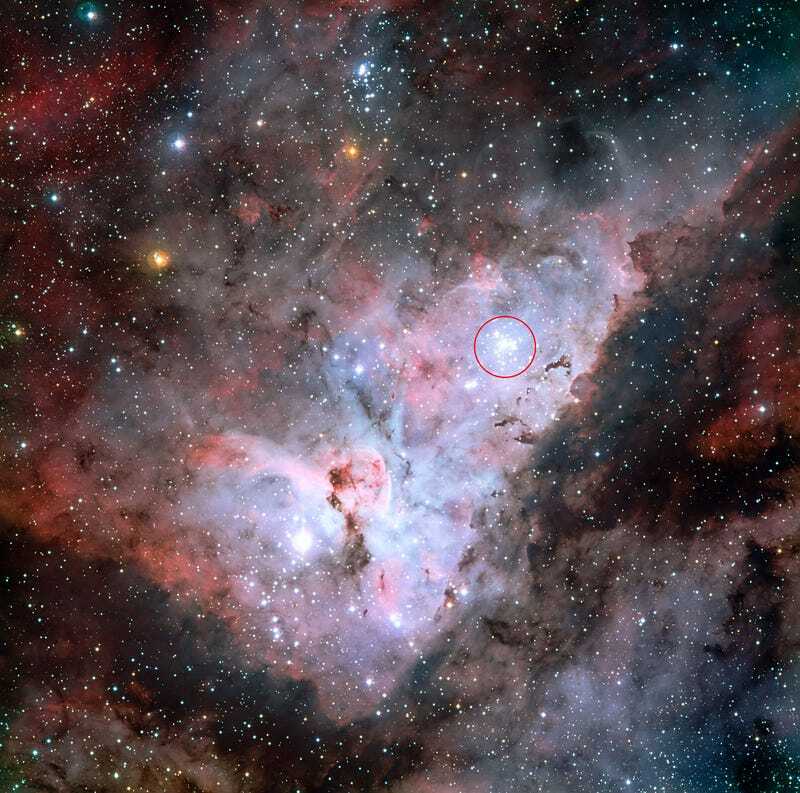 Trumpler 14 (circled in red) is located in the Carina Nebula. These photos would rock as your desktop wallpaper. Go ahead and download the images in various sizes and formats here and here.